What happened when Martha Redbone brought the spirit of Black Mountain, Kentucky to the Apollo? 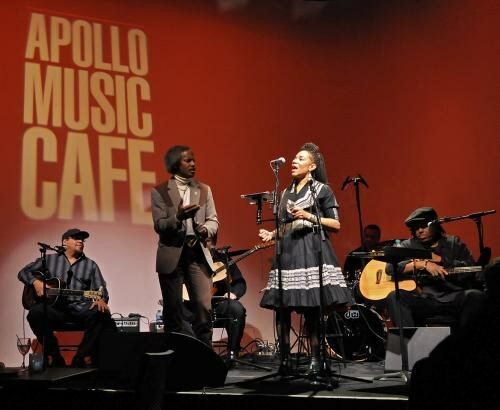 On a recent January evening, the soul and spirit of Appalachia visited 125th Street in Harlem. 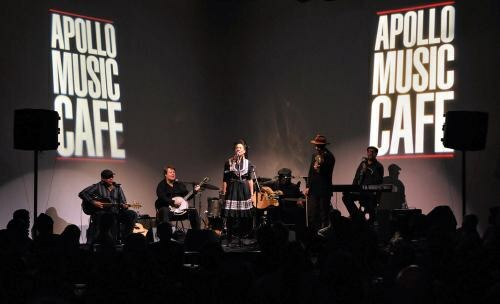 The Martha Redbone Roots Project filled the Apollo Music Café with the poems of William Blake and music inspired by Redbone’s childhood home in Harlan County, Kentucky. The centerpiece of the concert was The Garden of Love: Songs of William Blake, Redbone’s critically acclaimed album that features production by John McEuen (Nitty Gritty Dirt Band) and David Hoffner. Joined by a five-piece band, plus a fiddler and two guest vocalists, the Brooklyn-based singer-songwriter brought the Apollo to Black Mountain, delivering a rousing set that will certainly be remembered long past 2014. Perhaps host Lisa Yancey said it best at the outset of the evening: “Sister Martha is about to light this stage on fire”. “The Garden of Love” furnished the first spark, with Redbone wailing the opening line -- “I laid me down upon a bank / Where my love lay sleeping” -- like a shout from a countryside hill (or Morningside Park, to reference a nearby New York location). An air of suspense encircled Redbone’s voice before the band locked into a steady beat. The rhythm churned through Redbone’s hands as she stomped her feet, standing tall and commanding. Enchanted by the imagery of Blake’s words, she seemed to have momentarily transported herself to “the heath and the wild” of Blake’s poem. 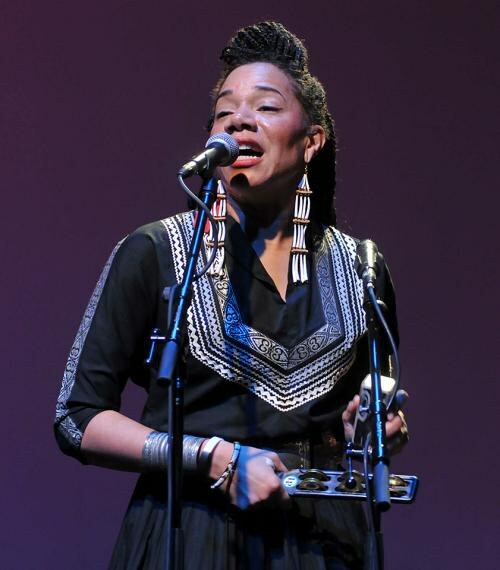 Redbone and her band continued The Garden of Love experience with “A Poison Tree” and “Hear the Voice of the Bard”. The singer explained that, while reading an anthology of Blake’s poems, she was struck by how the lines in “A Poison Tree” conjured the sound of a preacher testifying from behind the pulpit: “I was angry with my friend; I told my wrath, my wrath did end”. “That sounds like my family all right,” she quipped. Indeed, the parallels between Blake’s poems and the experiences of Redbone’s family in Kentucky are more than coincidence. They illustrate the deep roots of a community whose way of life has been perilously disrupted by strip mining and other industrial hazards. With original music written by Redbone, Aaron Whitby, and John McEuen, “A Poison Tree” is like a tonic for those ailments. From the band’s crystalline harmonies to gripping solos by Whitby on keys and Alan Burroughs on guitar, the live rendition of “A Poison Tree” only underscored the greatness of the studio version. Similarly, the jaunty “Hear the Voice of the Bard” was no less thrilling. For a moment, the Grand Ole Opry met the Cotton Club: drummer Gene Lake deployed some jazz cadences on the skins, Fred Cash played a loping bass solo, and Redbone surprised the audience with an interlude of vocal scatting. Redbone invited musician/author Lonnie Harrington onstage for “A Dream”. Harrington contributed a Seminole chant to The Garden of Love. Unlike the album version, Harrington began “A Dream” with the chant and led Redbone in an a cappella call-and-response. The band joined in, stoking the intensity of the music. Harrington’s voice, resonant and robust, hardly needed amplification as it rang throughout the Apollo. Just over two minutes on the album, the band extended “A Dream” to spotlight the full might of its power. 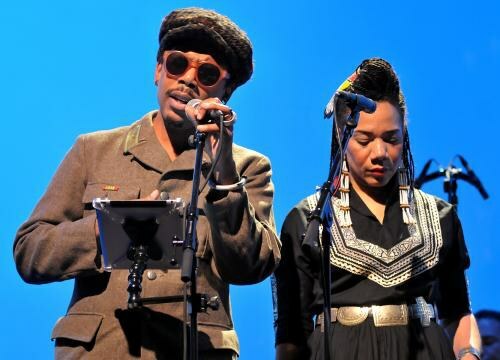 Throughout the process of selecting William Blake poems for the album, Redbone discovered “The Fly”, a somewhat whimsical meditation on what she calls the “finality of life.” She explained to the audience that at the time she found the poem, a lot of elders in Black Mountain passed away. By the time she reached the mixing stage of the album, both her mother and her aunt had died. In concert, Craig Judelman’s fiddle added delicate textures to the music box-type melody of the song. Judelman remained onstage for “On Another's Sorrow”, which complements the “The Fly” as evidence of Blake’s sensitivity towards all sentient beings. Here, the lyrics contain what Redbone called “little reminders of compassion for each other”. The song’s refrain -- “Oh no, never can it be” -- was one of the most memorable hooks of the evening. “Why Should I Care For the Men of Thames”, which featured evocative narration by Carl Hancock Rux (“the hardest working man in New York City”, said Redbone), was bookended by two inspired covers. The first one celebrated Ola Belle Reed, the late folk singer who brooke new ground for women in bluegrass. Redbone honored their shared Appalachian heritage with Reed’s “Undone in Sorrow”, one of more than 200 songs Reed wrote in her lifetime. 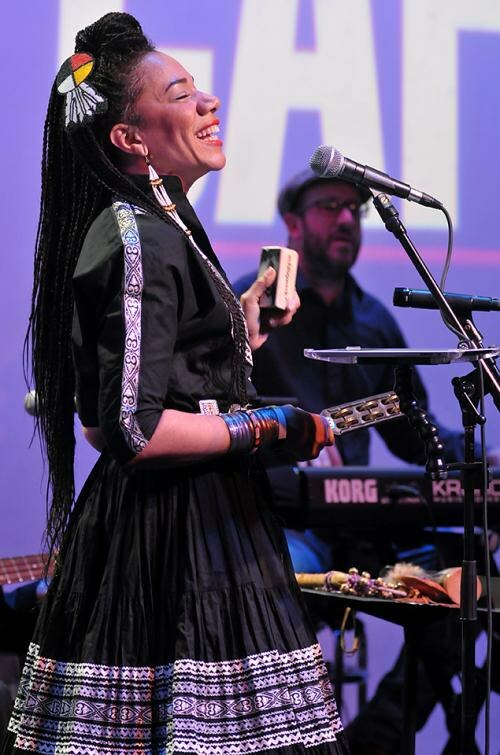 Redbone turned to her Shawnee-Cherokee ancestry on “Drums”, a song written by Peter LaFarge that details the U.S. government’s forced assimilation of Native Americans from their tribes into boarding schools. Most notably, Johnny Cash recorded the song on Bitter Tears: Ballads of the American Indian (1964). More than 40 years later, Redbone joined John Densmore (The Doors), Floyd Westerman, Keith Secola, and Dave Roe (Cash’s former bassist) for a contemporary recording of “Drums” that appeared on Rare Breed: The Songs of Peter LaFarge (2010). “It was so profound that we now include it in our shows,” Redbone explained to the audience. Redbone departed from the song’s familiar melodic lines and steeped the lyrics in a more foreboding atmosphere. The effect accentuated the reality of lines like “In our losing we found proudness, in your winning you found shame”. Redbone and her band powerfully recast a song that remains timely and relevant 50 years after it was first introduced to listeners. Though there were no shortage of reasons to see Martha Redbone in concert, one song made the price of admission all worthwhile -- “Skin”. Taken from the singer’s Skintalk (2004) album, Redbone transformed the song’s edgy funk-rock into a breakneck barnstormer of a performance, replete with Teddy Kumpel’s masterful banjo. It was simply a wonder to watch Redbone and her band deliver such a wildly different variation on “Skin”, taking nothing away from the original but instead finding an exciting new musical context for one of Redbone’s strongest compositions. After “Skin” set the Apollo ablaze, Redbone’s two closing numbers added more fuel to the fire. A blistering rendition of “Keep Your Eyes on the Prize” detoured briefly to Led Zeppelin’s “Whole Lotta Love”, wherein Redbone stepped out of Appalachia and channelled her inner rock goddess. However, it was “I Rose Up at the Dawn of the Day” that literally summoned people to their feet. Redbone and all her musicians amplified the joyous, rollicking spirit of the studio version. 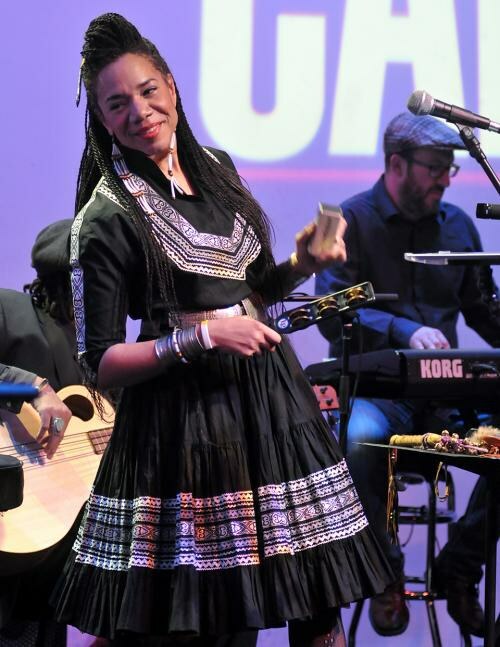 It punctuated an evening that showed why the Martha Redbone Roots Project was among the busiest touring acts of 2013. Doubtless, the embers Redbone left behind at the Apollo on that January evening are still smoldering.